Autodesk are in the process of replacing Autodesk Subscription Center with the new and improved Autodesk Account to provide a greater level or online service to their clients. Subscription Center is an online portal where Autodesk users can manage their product licenses, subscriptions and services. 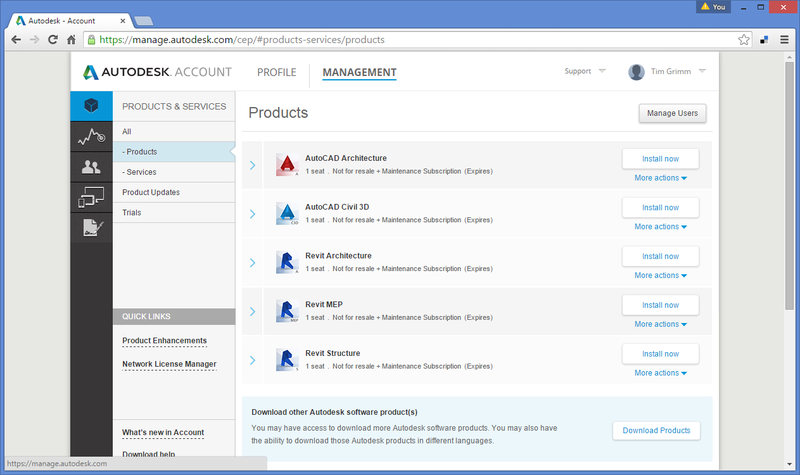 From Subscription Center, users can manage their Autodesk license and subscription accounts and services, download files, access support and more. This service is scheduled to close on March 13, 2015. a web portal where users can go to manage their Autodesk product licenses, subscriptions and services. This site provides access to download files, tech support, and other services. Autodesk is closing that service on March 13th, 2015. Autodesk will replace this service with the new Autodesk Account. From here you will be able to setup your personal profile, manage and access your licenses, subscriptions, software, services and a range of support services. This new service will be suitable for both maintenance subscription and desktop subscription clients. The interface is greatly improved for ease of use. You will be able to login using the same subscription ID and Password you currently use. From this screen you will be able to access your products and services including updates and trials. Also available is reporting on the licenses you have and the ability to add mobile devices. If you are trying to download the products you have on Subscription like Product Design Suite, you will need to select the Products link and Download other Autodesk software product(s). This will open a new window so you can access your downloads. Login to your new Autodesk Account and start using it now. See the video below which further explains the coming changes ... for further details.